Sales continue to take a minor hit after the mortgage rules were implemented. 110 sales last week is about the same as 113 from the week before. Before the change we saw 138 and 120. Likely a combination of slowing sales as we go into late summer, and some buyers being priced out. It seems quite unlikely that we'll hit last year's sales numbers this month. Our sales average is 16 sales/day, while we would need 21 sales/day today and tomorrow to match July of 2011. So far we are ahead in sales for the year compared to last year, but I suspect that will change going forward. Listings are lagging last year as well, but the last few months have seen a surprising number of new listings in the last few days, so we might still get there. Roger reports the weekly sales volume dropped to 113 from 138 and 120 in the previous weeks; atypical for the third week in a month or a sign of a sales drop off due to new mortgage rules? Time will tell. 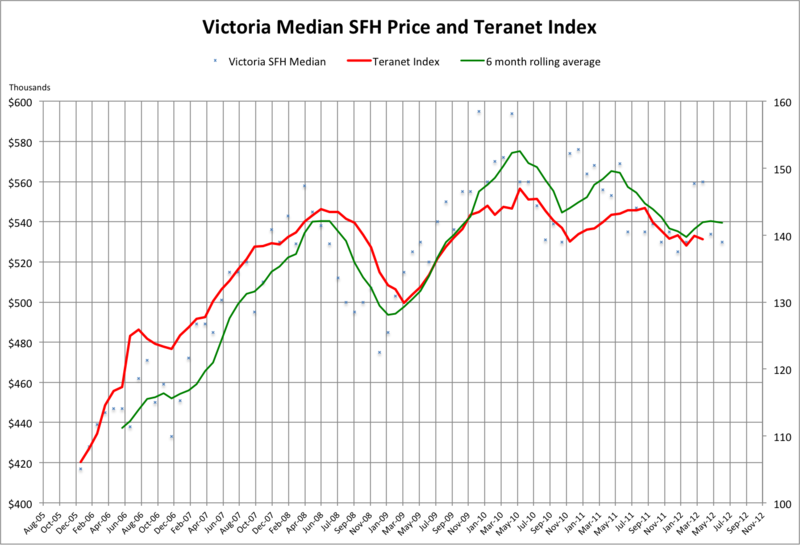 The SFH median is $527k, with an average of $570k, while condo average is at $342k so far. A sales boost over the last week as sales from before the mortgage rule changes are showing up as unconditional. According to Roger this could continue this week, so it will be interesting to see if there is any significant dropoff in sales the week after. Of course we are passing the peak sales period, so sales will naturally slow going forward. I think our month end sales and listings will hit very close to last year's again. August, September, and October have been sales dead zones the last couple years, I predict that this year will be even worse. Unit sales dropped significantly in the first week of July from June's average: 15 units per day versus 21--that's almost 30% in case you were wondering. Now there was a long weekend in there and July is typically slower than June and the first week is typically slower than the rest, but still 30% is significant. Will the trend continue? If so, we're on pace for 465 sales. First off, a big old tip of the hat to Roger for driving some media today and a kudos to local realtor Marko Juras for telling it like it is in the media. Roger's making waves, with questions on radio via twitter and graphs being used on a national real estate blog--though the author doesn't give credit where credit is due, which I'd like to say I'm surprised at but I'm not, which is one of the reasons why I have zero respect for the "fool." 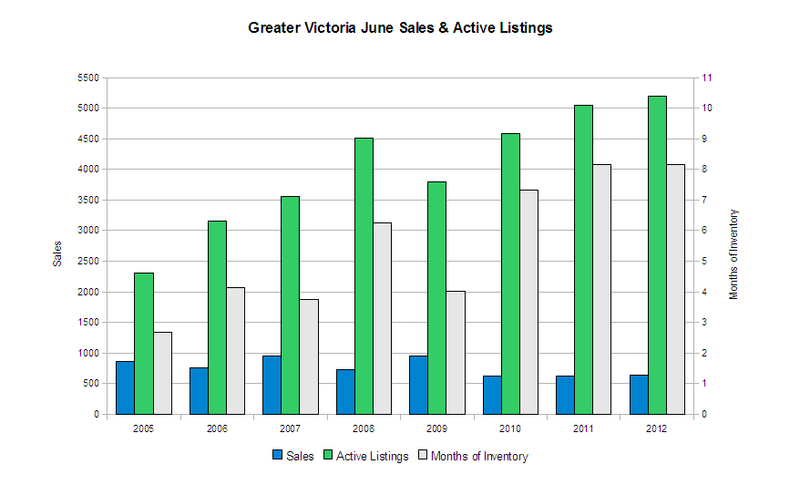 Regardless, Roger's graph below spells it out, Victoria's listings are higher than they've ever been. No wonder buyers are sitting on the sidelines. Sales at 637 are slightly ahead of last year's 618. Inventory is higher than last year at 5189 vs 5050. As Roger points out, this is actually an all time high. Average single family home price is $591k, which is down both from last month and from last year. However keep in mind that monthly numbers are highly volatile. Here is the context. "For our city, an average month has 10 days of sunshine" says Sam Salmon, President of the Victoria Tourist Board. "Days of sunshine during the last three months have been well ahead of that number." So record inventory, low sales, and prices looking weak. And all this is before the mortgage bomb hits in just a few days. Will it finally, truly, get interesting?